With 21 tested and proven marketing tools and techniques, your marketer can take the time and guesswork out of creating campaigns from scratch! Implement these 21 things and see results as soon as next month. Have you tried “everything” in marketing and it just doesn’t seem to work? Are you bored with what you’re currently doing to market your Practice and need some new ideas that you know will work? 21 Marketing Things is our #1 Selling Marketing Tool that provides you with 21 different marketing tricks and techniques that the Scheduling Institute uses on a daily basis! 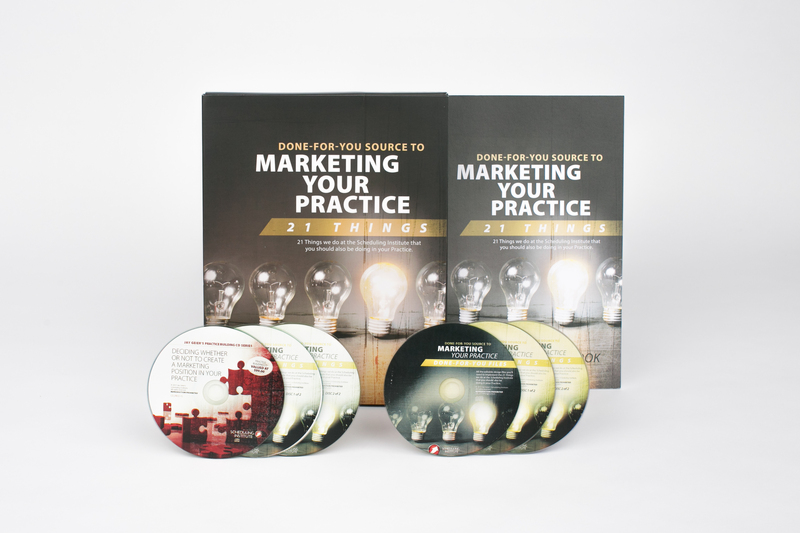 Gain access to email verbiage, video examples and done-for-you marketing postcards, letters and other mailers that will help take your practice to new levels of success! We know that each of the 21 items work because we’ve already tested each and every one of them and we know what works and what doesn’t, based on tracking the revenue and the response from each item. 21 Marketing Things is any marketer’s dream, whether they’re new to the position or a well-seasoned expert. Don’t have a designated marketer? No problem… this is the perfect place to start! Use this tool to give your seasoned marketer fresh ideas that work or pass it off to a newbie who needs a jump-start into the world of marketing. Throughout this kit, you’ll gain access to pre-formatted emails, templates, videos and more. A Scheduling Institute Member favorite is the Reactivation Campaign! You’ll be given a complete marketing calendar, pre-written emails, letters, text messages and pre-designed postcards! All you have to do is add your logo and hit send! This is the best, simplest, quickest, results-producing marketing tool in the industry! Audio and video of Jay Geier detailing each of the 21 marketing tools and techniques so that you fully understand how you can apply each to your Practice. This CD contains done-for-you examples, designs and copy so that you don’t have to start from scratch. One of the most difficult things about marketing is coming up with the content. That’s why we put together pre-written emails, letters, text messages and mailers just for you! We have even designed some marketing pieces so that you don’t have to hire a design team. You can get these pieces out the door today! These templates will make everything that much easier to start seeing results… and of course more New Patients and increased revenue. Are you ready to hire a marketing director? Or is this something that you’ll consider down the road? It’s important to remember that MARKETING = NEW PATIENTS, however, not everyone is in a position to hire a Marketing Director… yet! Regardless, 21 Marketing Things is perfect for a Practice with OR without a Marketing Director. For offices without, this tool is easy for any employee to implement. For offices with, it’ll help your marketer get effective pieces out the door and brainstorm new ideas! The Everything Guide to Writing Copy – From Ads and Press Releases to On-Air and Online Promos, all you need to create copy that sells! 3 pages into the study guide/book and already coming up with so many new ideas! This has become a brand new swipe file for me. If you’re guessing or debating on getting it or not… take it from me. I’ve attended Marketing Matters, Team Leaders and about to attend the Marketing U. You can’t get enough! Stats have sky-rocketed! Just wanted to share with you all that I invested in the 21 Marketing Things product and gave it to my front office. They followed the Reactivation process and had 82 patients schedule (reactivate) within the 1st 30 days! I’m a huge Fact Finder, so I want to learn how to do it, and not have to reinvent things, and work with a system that is in place that I know is going to work. And that is what I have been getting. There is so much stuff here that it would take forever to learn it on your own. Quality writing is an important skill set and it a very important factor in how potential patients and current patients perceive the office and the educational level of the staff. It must be done right. I appreciate Jay’s decision to emphasize copywriting and convey how important it is. I’ve known that I need to do sequences, campaigns and events, but I haven’t figured it out. I didn’t know how to go about it, but now I have a template. I am excited to start a reactivation campaign that has all the right steps.